Genre: Young Adult. Contemporary. Romance. Since her mother's sudden death, Emma has existed in a fog of grief, unable to let go, unable to move forward--because her mother is, in a way, still there. She's being kept alive on machines for the sake of the baby growing inside her. Estranged from her stepfather and letting go of things that no longer seem important--grades, crushes, college plans--Emma has only her best friend to remind her to breathe. Until she meets a boy with a bad reputation who sparks something in her--Caleb Harrison, whose anger and loss might just match Emma's own. Feeling her own heart beat again wakes Emma from the grief that has grayed her existence. Is there hope for life after death--and maybe, for love? 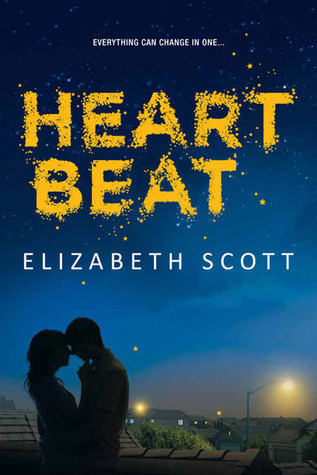 Despite the fact that she has quite a few books out, ‘Heartbeat’ was my first experience with Elizabeth Scott. I’ve been meaning to read her other books for ages, but I’m glad that Heartbeat was the one I started with, because I loved it. This story is incredibly unique- it’s not really something you read in books, and even in real life, it’s not something that gets discussed. I think that’s what makes this book so powerful. The story is about a teenage girl named Emma whose mother has passed away, but her body is being kept ‘alive’ to ensure the safety of her unborn child. Can you honestly say you’ve ever read a YA book like that? Of course, there’s the romance but most of the story revolves around Emma and her mother, and everything that comes along with that. It’s a book of serious rollercoaster-like emotions. The main character, Emma, is wonderful. She’s completely heartbroken at the loss of her mother, and as the book goes on, I found myself wanting to support her. I can’t even imagine what that would feel like, but I wanted things to get better for Emma. One of my favourite things was Emma’s best friend, Olivia, who is honestly so supportive and caring. I really liked how their friendship was just as important as the romance. Admittedly, this book isn’t really about the romance at all- it’s about family. It was so beautiful to see the connection between Emma and her mother, especially as I feel like sometimes parents are just disregarded in YA. Of course, I adored the romance. At first, I was worried that Caleb was going to be one of those bad-boys for no reason, but really- he wasn’t like that at all. He had so much depth to him that I didn’t expect to find- all of the characters did, it was really lovely to see such deep characters that worked perfectly in a story like this. I really give props to Elizabeth Scott. I can’t imagine that writing a book like ‘Heartbeat’ would be easy to do, but I really think that it was handled incredibly well. I can’t wait for this book to actually be released so I can pick up a hard copy for myself. Great review!!! I was not sure how to feel about this book, because I have been disappointed by Scott's books before...however, your review really made me look forward to reading this!